A heroic performance by Neroca goalkeeper Bishorjit Singh helped the Manipuri side down Churchill Brothers 1-0 after three consecutive wins in the Hero I-League encounter at the Tilak Maidan, Vasco on Tuesday (January 30, 2018). 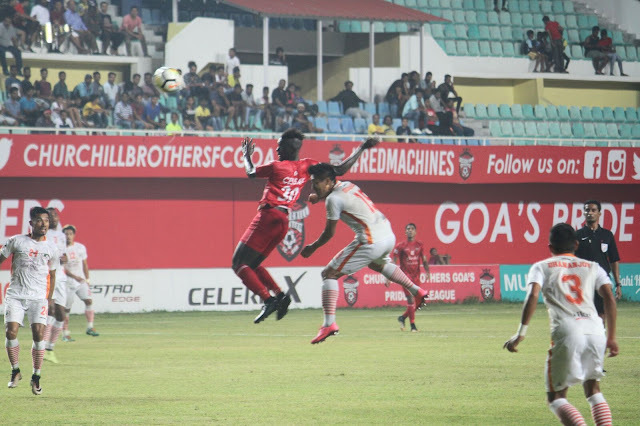 Felix Odili (22′) scored from the 12-yard penalty spot and Bishorjit stood tall between the Red Machines and the back of the net to register a much-needed victory after back-to-back defeats back at their home. Churchill Brothers named an unchanged squad that had beaten Indian Arrows 2-0 while there were three changes for the visiting Neroca FC. Neroca FC coach Gift Raikhan made three changes from the (0-1) defeat against Minerva Punjab FC with Saran Singh, Pritam Singh and Dhananjoy Singh coming into the playing eleven. Govin Singh and Gopi Singh were dropped to the bench while A. Israilov did not feature in the match-day squad. Pritam Singh made an immediate impact as he drew a double save from Churchill custodian James Kithan in the 8th minute. Offensively, Neroca FC were the busier team early on as they were firing from all angles but their efforts were mostly flying off target. They finally managed to find a breakthrough when Churchill Brothers’ fullback Wayne Vaz brought down Subash Singh in the box as the forward was racing down the left and the referee didn’t hesitate to award them a spot-kick in the 21st minute. Felix Odili stepped up and coolly steered the ball under the outstretched arms of Kithan as the visitors led 1-0 in the 22nd minute. 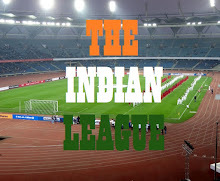 The home side then had to make a forced substitution when Uttam Rai injured himself and Israil Gurung replaced him. The Red Machines tried to get back into the game as they’re trying to deliver long balls to Koffi Mechac and Dawda Cissey in the middle from the middle of the pitch. But Neroca centrebacks Gouramani Singh and Varney Kallon aided by their full-backs stood tall. After a long passage of play that saw Churchill’s Denechandram Meetei pick up a yellow card, Churchill Brothers had their first goal-scoring opportunity in the 44th minute. Some slick interchanges of passes saw Koffi try to beat Neroca goalkeeper Bishorjit Singh at the farthest corner but missed by a whisker. After the changeover, Churchill Brothers started to dominate the game. They had a great chance when Meetei put a delicious low cross into the box that was not read by the Neroca keeper and Israil Gurung almost steered it into the net only to be denied by some last-ditch clearance. Churchill were on the ascendancy and were turning the screws on Neroca. Bishorjit had to make a timely save to deny PM Britto who tried to curl a shot into the net from 12 yards out. Meetei also tried a shot from distance that swerved away from goal. Then came a series of attempts from a corner when Osagie Monday, Ceesay and Eldor Hussein all tried to breach the Neroca backline which held on. Koffi had a shot after chesting down a pass from the middle but Bishorjit dived in time to hold onto it. It was then the turn of Bektur Talgat to fire at goal but that was saved again. Until the final whistle, Neroca hanged on to their slender lead to walking away with all three points to close the gap with leaders Minerva Punjab FC who are now 2 points ahead of Gift Raikhan’s boys having played two matches fewer. Churchill Brothers FC Goa will face another daunting task in three days when they host Minerva Punjab FC and Neroca FC will host Gokulam Kerala FC on 4th January 2018 next.